There was an overwhelming number of horses than cars when Ford started producing. There was an overwhelming number of gasoline cars when Tesla started producing. Both brands were catalysts opening a new era. 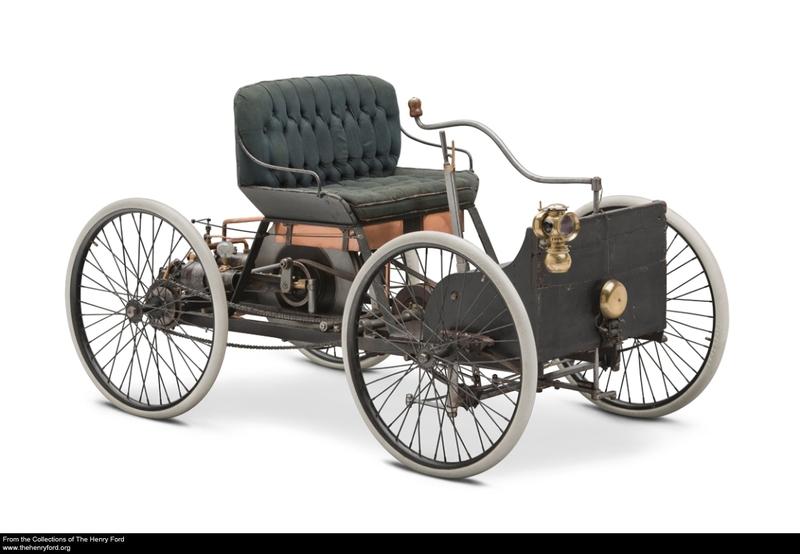 Many other companies saw the trend pioneered by Ford and Tesla and followed. The competition started and the rest is History. This does not mean that ICE vehicles will disappear overnight. But it does mean that we have already entered a new era in transport which will evolve much faster than the incremental scenarios produced so far. 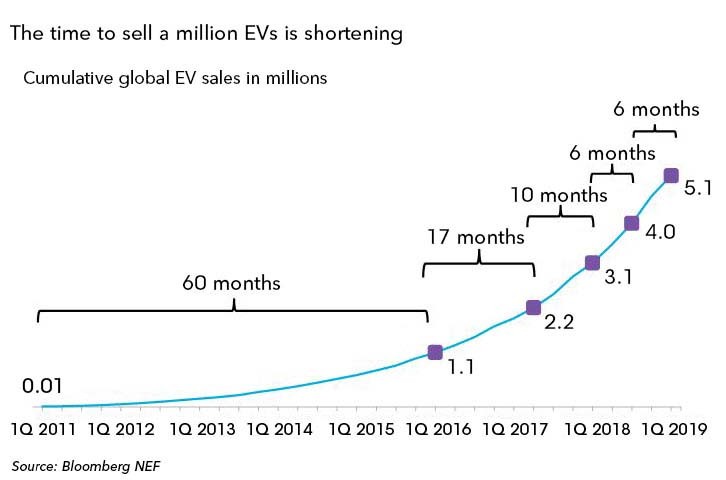 When in early 2017 we used a polynomial method to forecast 4 million EV by the end of 2018, we encountered a lot of skepticism before events proved us right. It should be noted that it took five years to sell the first million of electric cars. In 2018, it took six months. Forecasting, once more, the future of EV we foresee a jump in their number by order of magnitude, in the next few years. The point of inflection is the magical 5%. After that, the curve always takes off and shoots upwards. It is worth noting that China will achieve this number this year. Big Countries like the US, Germany South Korea, France, Canada, etc. will break the 5% barrier in the next very few years. The best paradigm relevant to the EV is the cellular phone as it does not only depend on an individual decision but is subject to infrastructure investment and regulation by Central Authorities. In particular, it took a quarter of a century for the cellular phone to be universally adopted. We consider that the EV started in 2010. Its adoption is likely to be faster than the cellular phone. We believe that in ten years from now, new EV sales will substantially exceed ICE vehicles sales Worldwide. 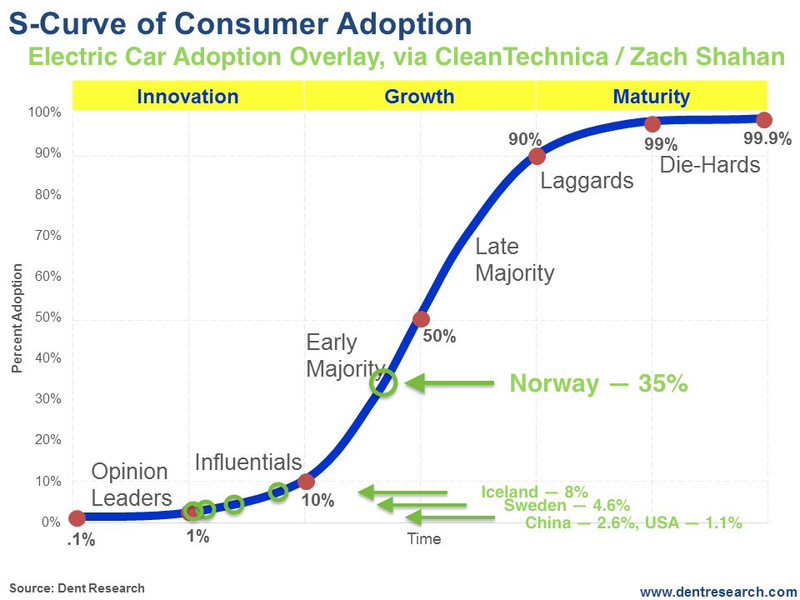 Norway and California that have already surpassed the 5% barrier in EVs, which is the equivalent to the Mach number in Technology adoption, are early buds. 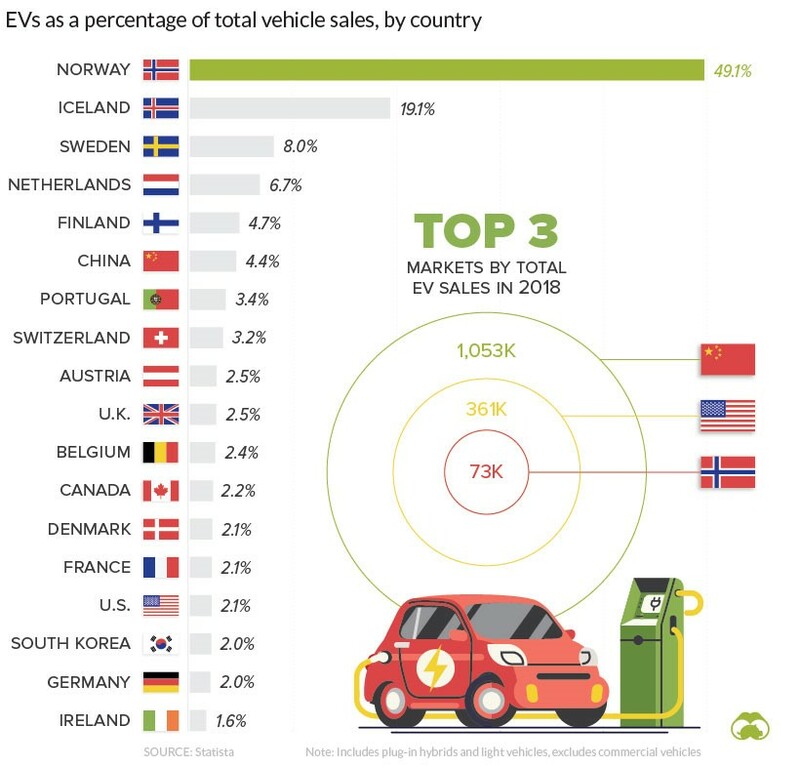 The big guns here are China, where EV adoption is State Policy in a Centrally controlled Economy and Germany where 58 billion euros are earmarked to be invested in EV production and infrastructure. The first is environmental where, the dramatic worsening of the situation, is pushing for renewable sources of Energy (no need for elaboration here*). The second reason is the amazing new technology uses for Hydrocarbons products and particularly Oil, that makes burning it, the less useful option. Both battery cost and battery charging time are dropping fast, making the EV a better option than the ICE Vehicle. -The lower operational and service costs of the EV. -The emergence of electric two-wheeler bikes, motorbikes, quads and even rickshaws, that are by order of magnitude more numerous already, giving impressive performances and which are fast becoming cheaper. These methods of transport are in mass adoption by the part of the population that may not afford yet the car and this is the greater number of people in the World. -The next stop is the Autonomous Vehicle. While this type of Vehicle is a decade away from adoption, it can only be electrical and it is the future. * UN Secretary-General António Guterres will also convene a Climate Action Summit in September. Of this report, Guterres stated: “These data confirm the urgency of climate action. This was also emphasized by the recent Intergovernmental Panel on Climate Change (IPCC) special report on the impacts of global warming of 1.5°C. The IPCC found that limiting global warming to 1.5°C will require rapid and far-reaching transitions in land, energy, industry, buildings, transport, and cities and that global net human-caused emissions of carbon dioxide need to fall by about 45% from 2010 levels by 2030, reaching net zero around 2050”. Our company, DVK Consultants, is a fusion of companies  specializing in many aspects of consulting. We combine passion with realism. Our consultants have long executive experience and subsequently have worked in consulting  internationally. Our proprietary technology enables enterprises to harness the power of location and understand real-world behavior. We specialize in assisting companies transition into the fast changing and digitally involving environment. We also provide classical consulting services as described in the relevant section.